The weather had been lovely for several days. I had completed my spring hive inspections and made up my first nucleus colony of the season to raise an extra queen in case I need one. Nucleus colonies are nice to have since they are half the size of a regular hive and usually include gentle nurse bees and brand new arrivals. 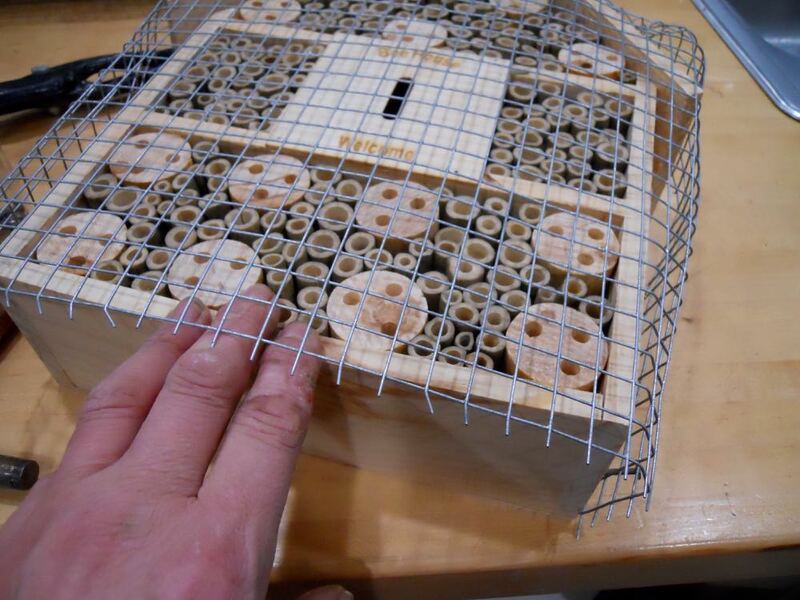 I had also pulled a frame of brood, or capped bees, and notched the frame to encourage bees to build queen cells. Shortly after setting up the nucleus colony, the weather took a turn back to winter. Knowing that this nuc was vulnerable, I wrapped it in one of my black quilted insulated hive wraps and moved it to my garage for the weekend. The bees were kept inside by stuffing a muslin kitchen towel into the entrance. I was feeding this small group of honeybees with sugar syrup through a mesh circle in the middle of the nuc box. Having them in my garage made it quite convenient to check them for food and give them more, if necessary. By the second day, they were quite louder when I removed the jar of sugar syrup to give them more to eat. The raised noise level let me know they were not too happy to be locked inside so as soon as the forecast turned warmer, I returned them to my garden. Today I checked the frame and found three new sealed queen cells so the girls have been busy. One of the cells is now in another colony and the girls have two queen cells to raise once the queens hatch. If all goes well, one of the queens will go on a mating flight and come back to establish a new colony. I will know in another 4 weeks or so. Adding native bee houses to your garden is a wonderful way to add nesting spots for those solitary native bees, of which the US has about 4,000 out of the 20,000 native bees worldwide. 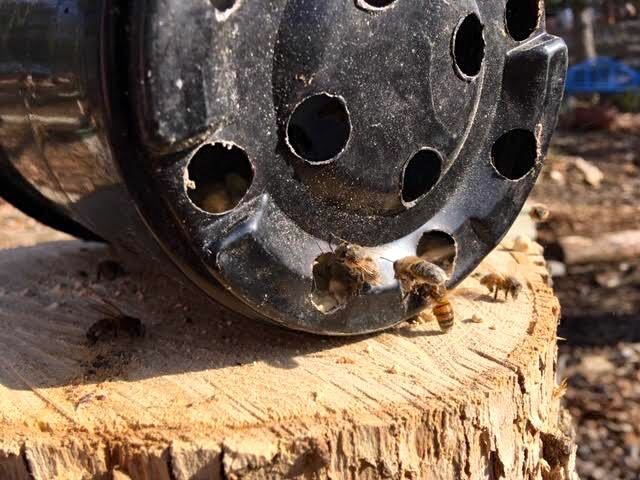 However, most native bee houses are sold without a protective metal covering keeping birds from using the native bee houses as snacking stations. To protect my native bee houses, I add small gauge wire around the front to keep birds from eating the bees while they hibernate in their mud-covered homes. To add wire around your native bee houses, slowly cut the wire with wire cutters the length of the front of the native bee house and wider on the sides. You also want about an inch in the front between the native bee house and the wire. For native bee houses with angles, just fold the wire to fit being careful not to cut or nick your fingers. Keep measuring as you nail to make sure you don’t pull the wire too tight and close to the native bee house. 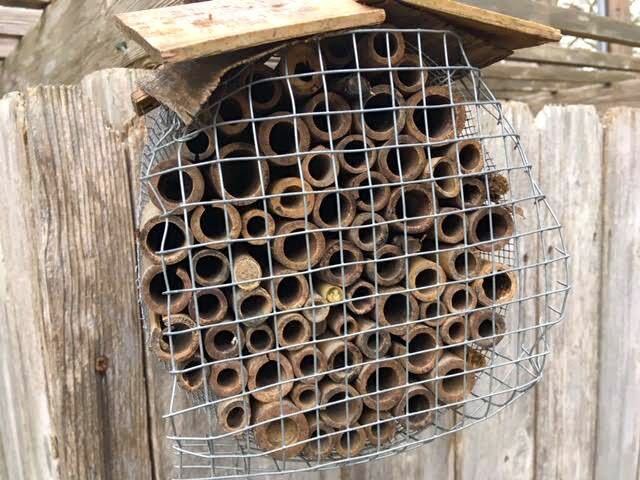 The idea is to keep birds from getting their beaks into the native bee nests. Take it slow so you don’t puncture your hands with the cut wire. Not all native bee houses are so large, my first native bee house has been repaired several times but still hosts native been tenants every year. The key is to protect the slumbering native bees from birds. There are a number of sources you can tap for native bee houses, from Aldis to your local home and garden centers. If you are handy, you can also dry bamboo and cut the stems into same length segments and make a box to house them. Either way, having native bee houses in your garden will encourage wonderful pollinators! Late winter is a challenging time for bees. If winter temperatures have fluctuated between over 40F temperatures, when bees can fly and below 40F, when bees cluster, bees may have used up their honey stores by January and run the risk of starvation. At the same time, late winter means the queen bee has been slowly laying. She starts when daylight starts to extend at the winter solstice Dec. 21, adding more mouths to feed. In addition to supplemental feeding in the “eke,” an added top shim, I monitor February temperatures and may give them a little supplemental pollen feeding to help them get a good strong spring start. I watch the weather forecast and note when temperatures may be over 50F for 10 days to provide the food. Pollen is what worker bees need to feed newly-hatching bees. There are a number of pollen feeders on the market; even more you can make yourself out of PVC pipes and plastic paint buckets. I have found the plastic plant pots work well for me especially the ones with many holes on the bottom. To ensure the plant pots don’t fall off their tree stump stands, I add a large rock at the front to hold the pots down. The rocks also give bees a place to land and to safely stage their takeoffs when their pollen baskets are full. I don’t feed the Pollen substitute for long, there usually is a 2-3 week period between the end of cold weather and the beginning of floral sources in nature. Supplemental feeding encourages more egg-laying and that can mean the colony will run out of room before you can get into it to add supers and may swarm so monitoring colonies is important. I also enjoy sitting close by and watching the bees as they come in and leave. If you are a new beekeeper, this is a good opportunity to observe your bees. When I first started beekeeping, the more experienced beekeepers only talked about using sugar - mush bags, sugar cakes, candy boards - all carbs for winter supplemental feeding. I understood the concept, that this was to supplement stored honey supplies in case bees ran out mid-winter. However, even honey, real honey, contains pollen, which is a protein source, or food for bees. More specifically, nurse bees need protein to trigger their glands to produce royal jelly so they can feed bee larvae. Studies show that under-nourished bee larvae grow up to be unhealthy bees. With the other bee stressors including pesticides, pathogens and poor foraging areas, good nutrition has become a priority in my apiary. For two winters now I have been feeding my winter bees both sugar cakes and winter protein pollen patties in addition to giving the a medium super full of honey at the beginning of fall, then replacing empty honey frames with more frames of honey end of November. At this point in a relatively mild winter, all of my colonies are now in the top box showing very healthy colony numbers on warm days so I worry less about them pulling through winter because the cluster is too small. So let’s take a look at a few of my hives and what I found under the inner cover when I inspected them on a sunny day that was 67F in early January 2019. I am located in mid-Missouri. This is a second year queen that went into winter with very strong colony numbers. All colonies were treated with formic acid strips end of August to knock down varroa mite numbers going into winter. I treated because my varroa mite count was 10 mites per hundred when voluntarily tested by the state and analyzed by the USDA Bee lab in Maryland. Even with replenished honey frames, my colonies seem to gravitate to the top of the hive on warm days. This particular colony was like the rest, the colony had consumed the winter pollen patty so I replaced it. Here’s another hive check. This colony is in its third year and also had finished their winter pollen patty so I added another one. Add Honey Bee Healthy and vinegar to measuring cup; then add water to 7 1/2 ounces. Mix well. Spread in bread pans and re-used fruit clam shells. Leave overnight in cold oven to dry out. Once top is dry, remove and turn over on a cookie sheet to let the bottom dry out for a couple of days. If you end up with still moist patties, re-mix and add a little more sugar, then dry again. If you don't need to use immediately, store in sealed plastic container. 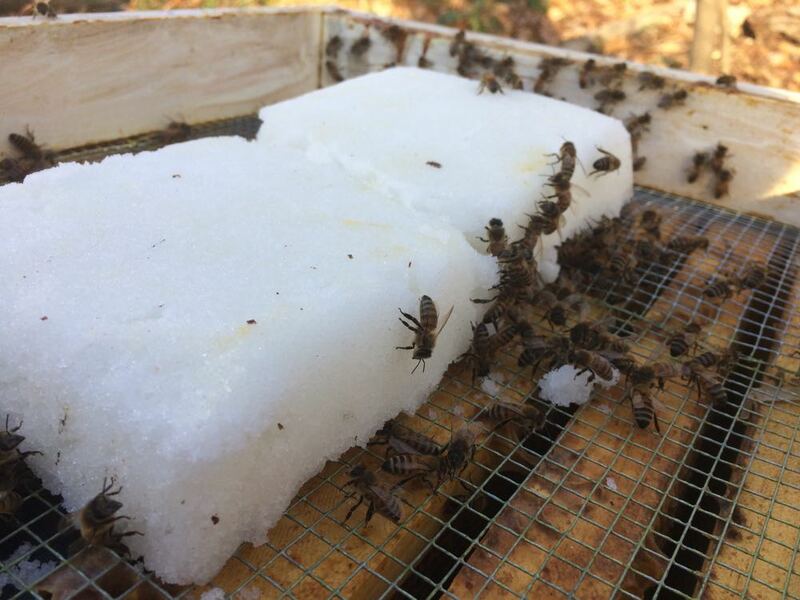 Sugar patties not only provide supplemental feeding but also help to keep moisture out of the hives. Now to yet another colony check, this one the smallest colony with a first year queen. As beekeepers, especially ones who keep bees for honey, it’s easy to focus just on the carbs or sugar. For a colony to be healthy, however, and be able to collect flower nectar as both flight fuel and winter food storage, or honey, they need to be healthy and that means they first need pollen, which is protein. I will be interested to see how my colony numbers are coming out of this relatively mild winter with the colonies getting both the nectar-substitute in the form of sugar cakes as well as protein patties. Since small hive beetles also winter over inside the colony cluster, I keep my winter pollen patties small, about the size of the palm of my hand. The larger colonies may get two pollen patties, one each on the edge of the cluster and I checked the pollen patty bottoms to make sure there are no small hive beetle larvae getting established. Do you feed your bees both sugar and protein pollen during winter feeding? How I use muslin kitchen towels to keep my bees calm during a hive inspection. This may be one of my favorite beekeeping hacks, using muslin kitchen towels to keep my bees calm during a hive inspection instead of smoke. If you are a beginning beekeeper, some of you may find that trying to keep your smoker lit, and having cool smoke, is a bit of a challenge. 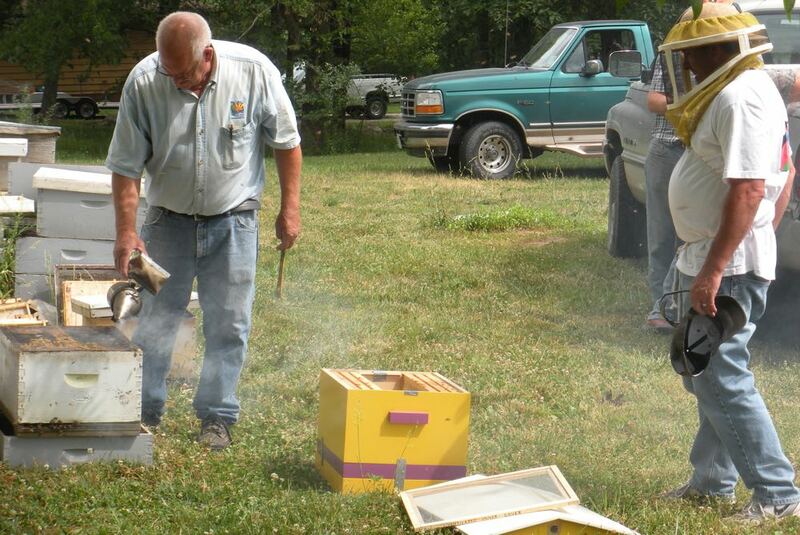 If the smoke coming out of the smoker is too hot, you can burn bee wings as you apply it to a hive. There are several theories of what smoke does to a colony. From my observation I tend to lean to the one that says bees go into preparing for a quick hive escape when smoke is applied, thereby giving the beekeeper time to get in and out. The smoke stresses bees so I prefer not to use it if I don’t have to do so. Since I take photos of what I find, I tend to need a little extra time inside my hives. Enter one of my favorite beekeeping tools, the muslin kitchen towels. They are not as beautiful as these hand-embroidered beekeeping towels but they are very handy to have in my inspection caddy. Muslin is smooth and doesn’t catch bees in their fibers. The towels themselves can be purchased at your local big box stores in the kitchen utensil section for about 75 cents per towel. Check the packaging. I have seen the bundle of towels vary in number from 5-8 per package. Once covered, I uncover only the width of a frame as I inspect the inside of the hive. Once you’re done, you can easily wash and hang dry these muslin kitchen towels. I dry them by hanging on a towel rung so that the fabric softener doesn’t get into the towels. I don’t know what pheromones bees will pick up from fabric softener. I also use these towels as neck scarves under my bee suit, and tied around my head when the suit hood is too big. Muslin kitchen towels also come in handy in the kitchen only mine never quite make it there. Frames with propolis against a wooden hive box. You bet the two stick together! If you are just starting beekeeping, this will not be exciting but trust me, do it now and you will thank me later. I'm talking about adding metal strips to the hive frame ridge so the frames easily move from side to side. 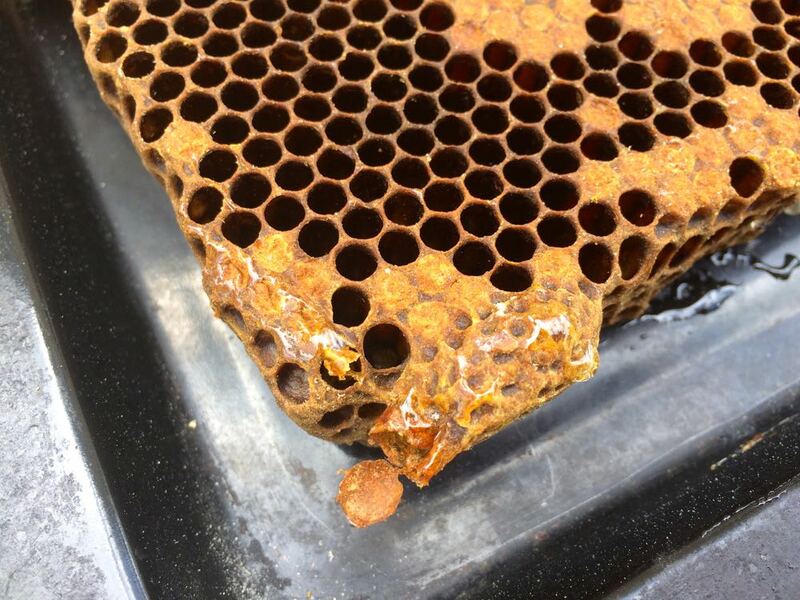 In other words, the metal keeps bees from glueing the frames down with propolis, an amazing antibacterial tree sap mixture bees use to protect their home. When I first started beekeeping, I had a challenging time getting some of the basic woodworking skills down. I still find frames I tried to nail together without glueing first with Titebond II glue. Yes, do glue your frames first. The weight of capped honey later can stress those little wooden pieces. Same thing with adding frame ridge metal. It's easy to put off adding those strips until the ridge becomes full of propolis and you need a tire bar to remove a frame. Ok maybe a tire bar is a bit much but at my apiary, located in the middle of a limestone hillside, my bees amply apply propolis. This spring, as I was repairing woodenware, I figured out how to get those little metal strips easily attached. I turned the box so that the inside was easy to access. Once I cut the metal strips to size, it was easy to get them nailed on. 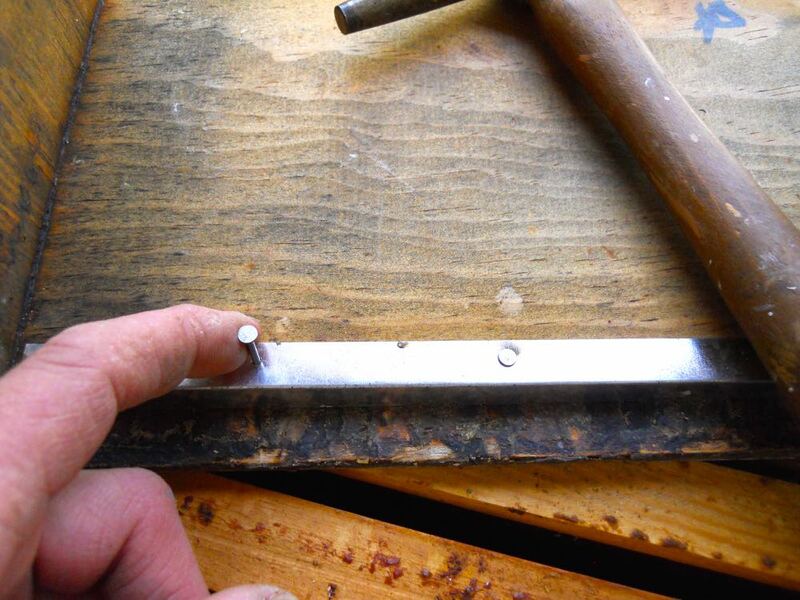 Hammering the tiny nails into the thin metal frames is easy once you figure out how to set it up. A beekeeping friend suggested you can use needle nose pliers to hold those tiny nails if you don't want to hold them. Good idea if you have a tendency to hammer your fingers more than the wood. Use wire clippers to cut the thin metal into the length you need. Once you have these metal strips installed, you won't want to deal with hive bodies without them. They keep frames easily moving and make it much easier to get into and out of them. Now the wooden frames will more easily slide across the ridge inside the bee hive. 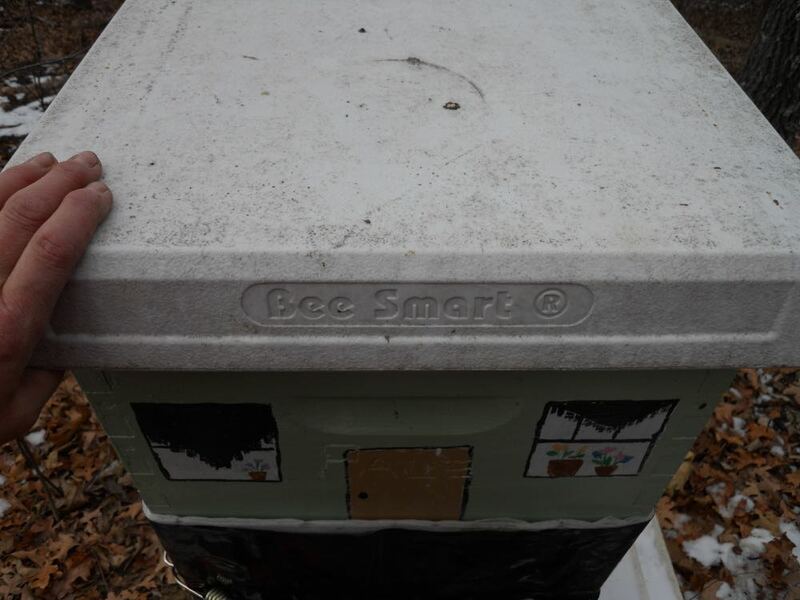 You can add them later, too but it's better to add them when your hives boxes are brand new. The metal strips will more easily fit against the wood ridge that hasn't been filled with propolis. If you do have propolis, set the hive box in the sun for a few minutes, it will help melt the propolis so that it is more easy to remove. This is a gift you give yourself. Here is a gift you can give a bee lover! A queen bee walking between the frames of a Langstroh hive in my apiary. One of the critical skills for any beekeeper who wants to be sustainable is raising his or her own queen bees. There are a variety of ways to raise queens, and one of the easiest ways is to "notch" a frame of eggs to encourage the bees to raise the queen cells. Then it's a matter of being patient until the queen bees hatch. The critical part of encouraging worker bees to raise queen cells is finding the correct aged egg, preferably still an egg in the royal jelly where the mother queen has laid. That means seeing a very tiny white egg in a white substance in a tiny wax cell that is less than 36 hours old. Once an egg is located, the wax cell under the egg is cut away to encourage bees to raise a queen cell. Several notches under 36-hour or less eggs on a wax frame. This technique also works when one is splitting a colony and leaving some bees without a queen at first. My beekeeping buddies David and Tom did that with a new colony a couple of weeks ago. We went back to see how well David had notched the frame to encourage queen cell building. Here are the bees in their new hive box. This is a two-week or so split from a booming nucleus established a couple of months ago here. Using a black foundation for a brood frame helps in being able to see the eggs laid in royal jelly. How many queen cells can you see on this frame? The verdict? There were 14 capped queen cells and 4 open queen cells occupied and still being fed. You bet, especially if you can see the eggs! Honeybees on a piece of bees wax, it's amazing how quickly they will have it cleaned out. When people find out I am a beekeeper, the second question they usually ask is what do I do with all of the honey. What they really should be asking is what do I do with all of the more valuable hive by-product, the lovely wax. Honeybees are amazing creatures. In their tiny bodies they pack a variety of glands including ones on their undersides that produce slivers of wax. Once packed on top of one another, the wax forms the intricate network of comb in which bees store pollen, nectar and larvae, the three basic components of a bee colony. It takes 8 pounds of honey to make one pound of wax so to a beekeeper, wax is golden. Besides all of the ways people use wax – for candles, lip balm, mustache grooming – wax is also a reusable product in a hive. To be able to reuse wax, a beekeeper can heat wax to melt it enough to store it until it can be used again. Don’t use your regular cooking pots to do this, I purchased a pot at a local thrift store and have it stored in my garage with my other beekeeping supplies. Also remember wax is flammable so never leave heated wax unattended or close to an open flame. This is wax and other debris in water heated over medium heat. Wax is slowly melting. 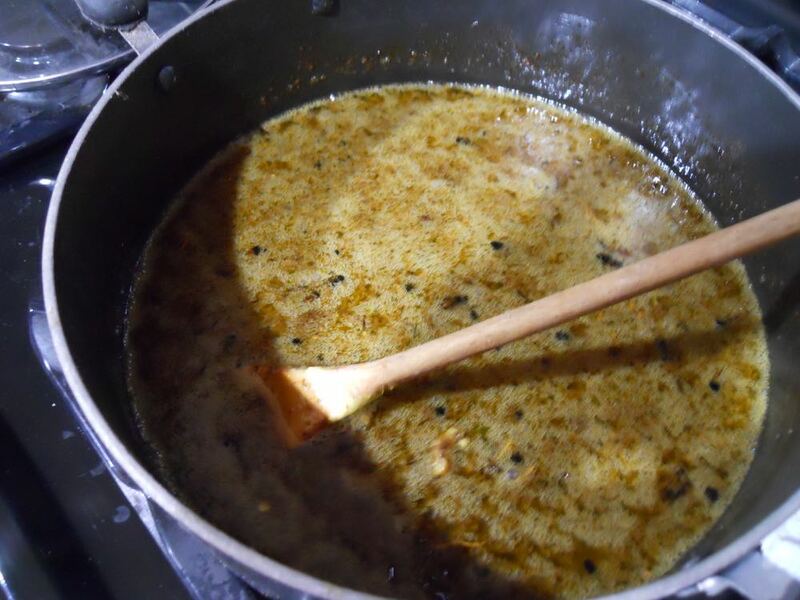 To melt wax on a stove, place the wax in water in a pot and stir until the wax melts into a waxy soup. You will know its ready to pour out of the pot when all of the wax is melted. A piece of cheesecloth over an old colander helps catch debris as the wax soup pours through. Add cheesecloth to a beekeeping-dedicated colander sitting over a bucket of water half-filled or less. This white plastic colander fits the top of a plastic container where I add water. Here's why you want a dedicated pot. Once cold water hits the pot, the wax solidifies in the bottom. Once the wax is all melted, carefully pour the wax soup into the colander to collect any residue and let the remainder fall into the water. Once cooled, you will find a disk of wax floating on top of the water. To purify it further, you can heat it up again, pour it through another layer of cheesecloth in a colander and pour it into another bucket of cold water until the wax doesn’t have any impurities. Wax will form in the shape of the container and float on top of the water. Store in a tight container until you want to use. 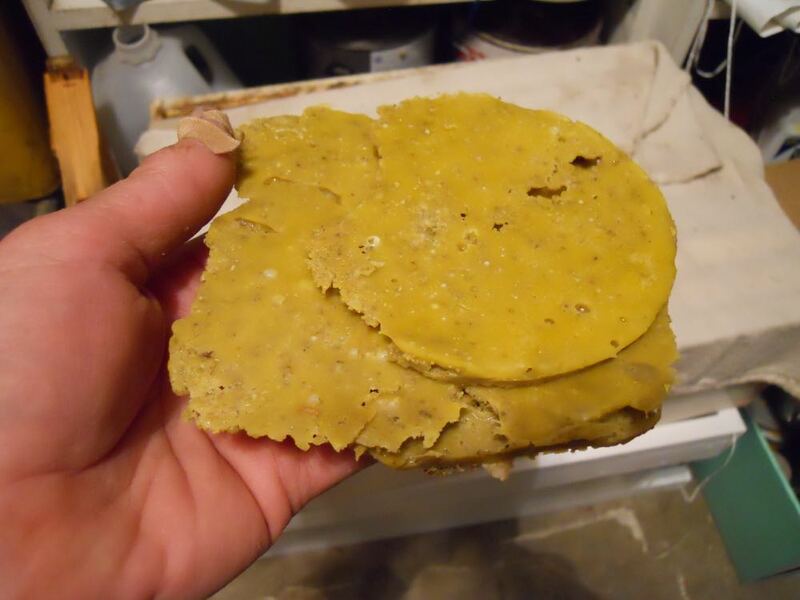 Don't try to store the un-rendered wax, it does not keep well in any container. You can melt the rendered wax again and paint it on plastic frames to re-coat them. You can also use the wax to make candles or lip balm. They want to know how many times I get stung. One of the most daunting challenges for new beekeepers is deciding when to add space to a hive. Over the years, beekeeping students have asked for help in looking into their hives to determine if it "is time." It's an important question because too much room and sub-Sahara African small hive beetles could easily take over unchecked. Too little space and the colony will start building swarm cells and moving out every time a new queen hatches. 1. Space to Grow. When bees are covering 80% of the frames. For an 8-frame hive that would be 6 frames; for a 10-frame hive they should be on 8 of the 10 frames. 2. Laying Space in the Right Place. In other words, check your frames to make sure your queen has space to lay. Often as the nectar starts flowing, worker bees will stash nectar away in every nook and cranny including the brood chamber, taking laying space away from the queen. 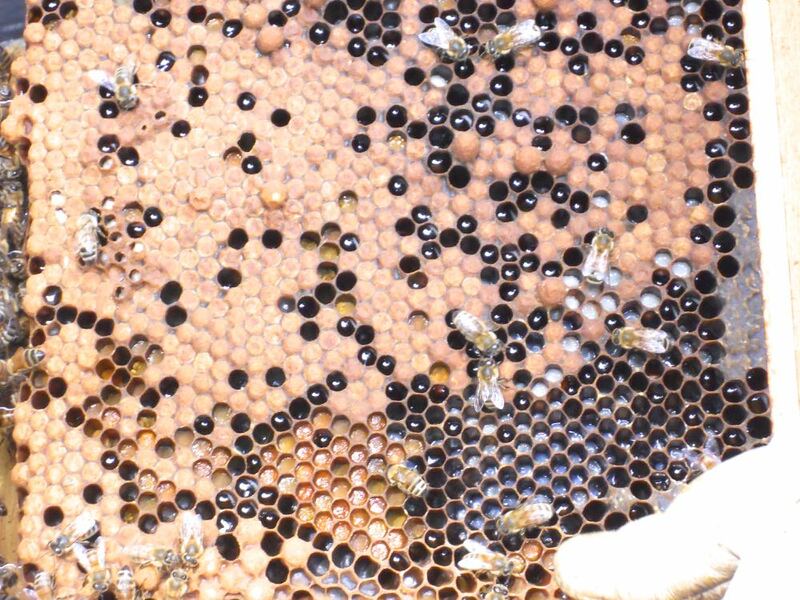 In photo is a brood frame filled with nectar, leaving the queen with no room to lay eggs. If you find most of your frames in the brood chamber filled with nectar, take 2 frames out and place them in the box above. 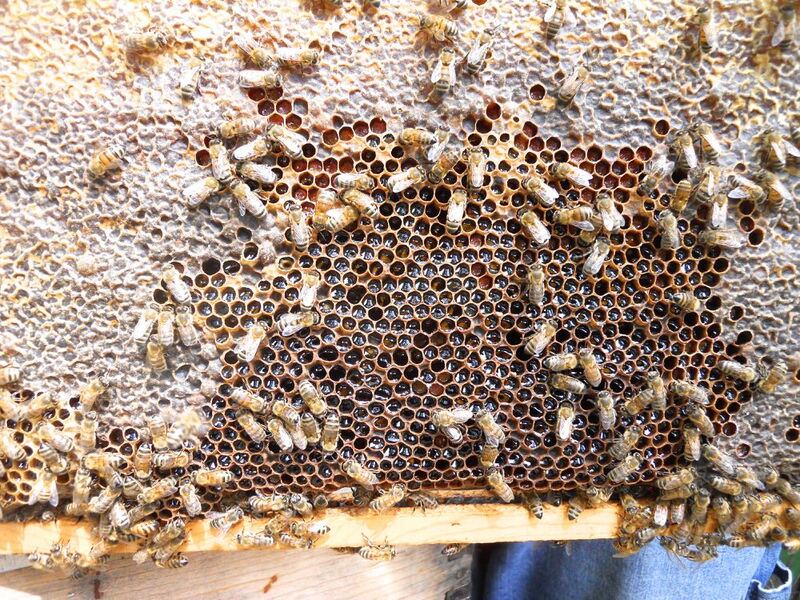 Replace the frames you moved up with new frames, preferably with drawn comb so the queen has room to lay. 3. Spot Difference Between Drone, Brood and Honey Frames. They can look very similar but there are distinct differences. Drone brood looks like bullet casings, or pencil erasers sticking up out of the comb. By comparison, regular capped brood is flat and even with the comb. 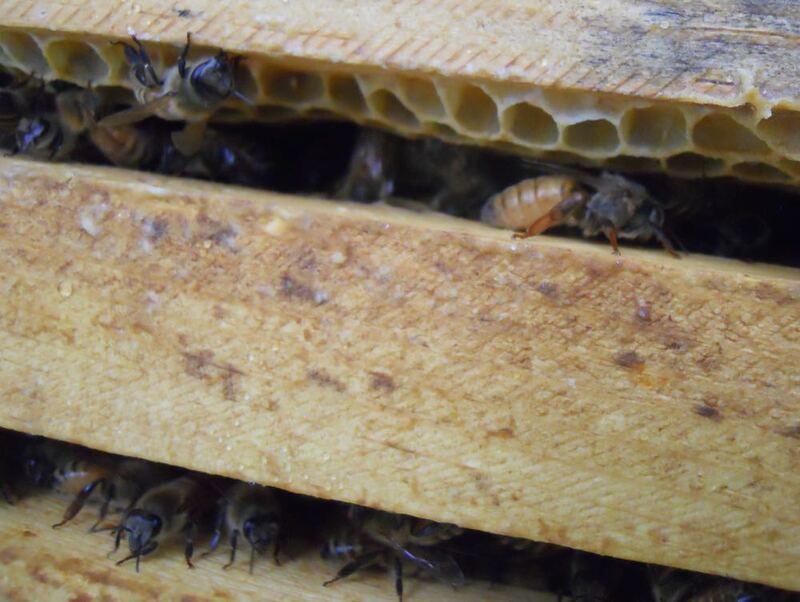 In the photo, drone brood is in the center and flat, capped brood is on either side of the frame. 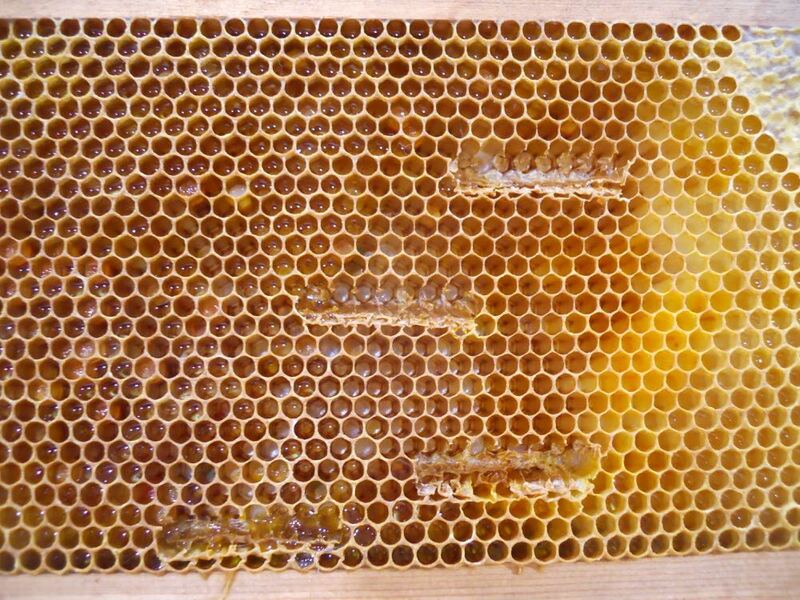 A frame of capped honey can be in a variety of shapes, some are straight against the frame, others stick out because the beekeeper didn't keep the frames close together. Regardless, capped honey is easy to recognize once you start seeing the differences. 4. Now for a test. What do you see in this frame? If you look closely at this frame, you can tell the drone cells sticking out towards the top compared to sealed brood flat against the comb. 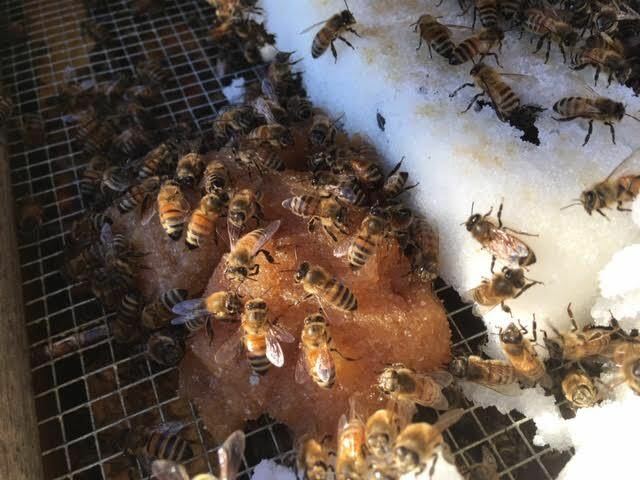 Some cells also have uncapped nectar, bee bread in a variety of colors, and a sure sign your queen is laying. So what do you think, does this colony need more room? 5. Check for Swarm Cells. When a colony needs room, they will build queen cells to raise a new queen so the old queen can leave with 1/3 of the colony and establish themselves in a new home. First raise the box and check underneath, see any peanut-like protusions at the bottom of the frames? Those are queen swarm cells. If the queen cups or cells are in the middle of the frame those are supercedure queen cups or cells. For some reason, the worker bees are raising a new queen in that center queen cell to take over for the existing queen. Is the swarm cup or cell at the bottom? Is it filled with a white substance? That's royal jelly and the worker bees are building a new queen. Is the swarm cup at the bottom uncapped and empty? That means a new queen has hatched and perhaps already swarmed. 6. Sure Sign of Trouble. If when you look through your frames you don't see a lot of filled cells, keep looking. Wax moths will move in when a colony is in trouble so if you see their web-like filament running through cells, your colony is in trouble. Maybe you lost your queen so go back through the frames assessing the rest of them. Remove the empty ones, move your colony into a smaller box so the remaining bees can protect the colony and start asking around for anyone who has a new queen. What are you think about this hive, does it need a super? My 8-frame blue hive and my first grey, now repainted green 10-frame hive in my garden. Have wooden bee hives to paint? Good news, bee hives don't have to be a boring one color, such as white or grey, and certainly don't paint all of your hives the same color. Honey bees will literally "drift" from their home base as they return with pollen, often settling in the hives on the outside of their periphery. Or the hive closest to them landing with a heavy load. Every hive should have a distinct personality. The easiest way is to give each hive a different geometric design so bees can tell which one is their home. The hives can be the same color as long as each one has a unique mark. To paint bee hives, use a latex paint, it dries faster and is easier to clean off of you. Don't paint the inside of the hive, only the outside and the hive rims. Also don't paint frames, inner covers and queen excluders. You can paint the edge of screened inner covers. I also recommend painting the inside of your telescoping covers so you can more easily spot small hive beetles. Make sure you give them time to dry or they will stick. Here's one simple hive that used two paint colors to give their hive a distinct look. This beekeeper used yellow and a dark pink to give his hive a distinct look. If you have kids, get them involved in decorating the hive. This hive was decorated with a child's handprint motif. Kids hand prints help to give this hive a distinct personality and look. 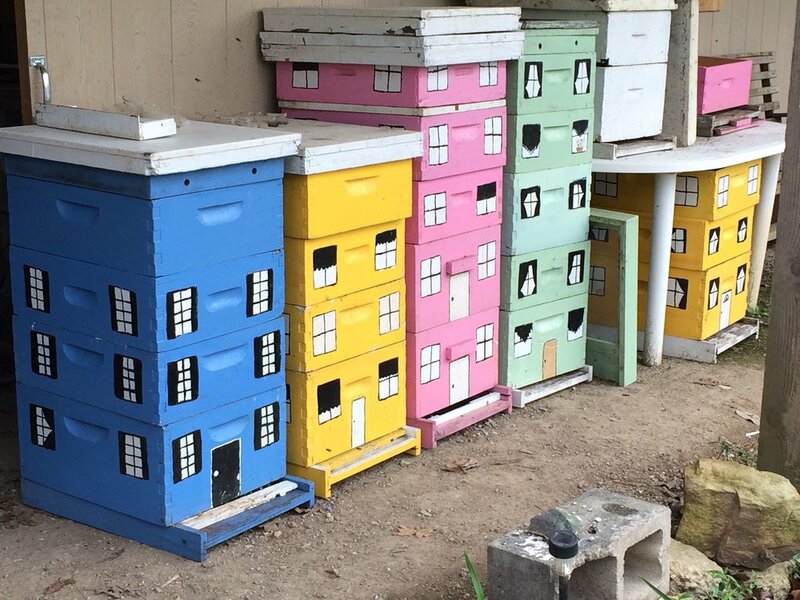 Side view of these hives painted with the help of young artists. One of my first two hives I named after my mother, Gertrude, and my grandmother, Mildred. Then with a winter available, I repaired the old hives and painted them to look like houses so my neighbors better understood what the hives were. Some of my first painted bee hives repainted from their original drab grey color. Uh, oh, honey maple hive has the color scheme out of order, wonder if David noticed! For his nucs, David has numbered and labelled each one as well as given them different colors. As you can see, you can be as simple, or as creative as you want to be. To get a variety of colors, home improvement stores sell sample jars for around $3. If you first prime your hives, the little jar of paint will easily cover 6-8 hive boxes. 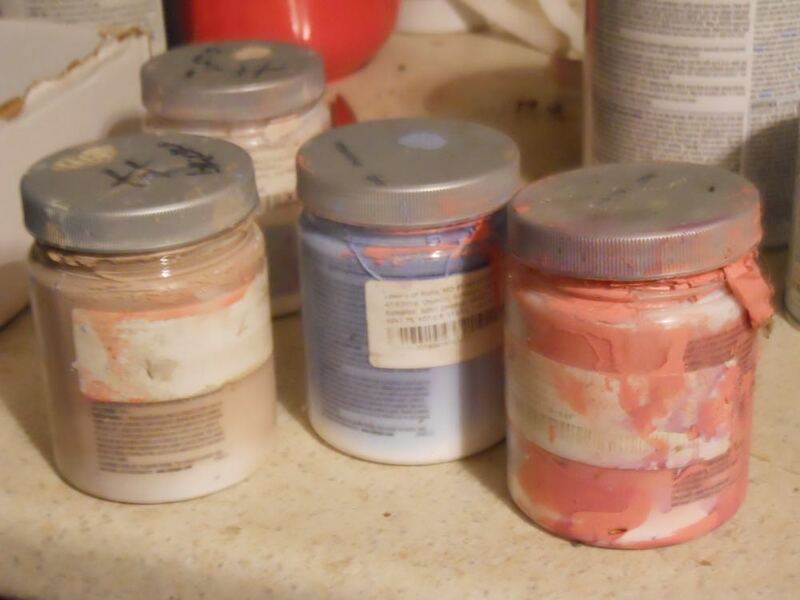 These are some of the paint samples I borrowed from David. Yes, they get a little messy. Big box stores also sell craft paints in small jars for $3-$5 each. In terms of colors, find something that will look nice in your garden. Remember bees see red as a grey color and don't like dark colors like black, brown or navy blue so pick colors that will make you, and your honeybees, happy. This old bird bath has been repurposed into a bee bar in the front of my Missouri garden. There are a number of ways beekeepers can provide honey bees a water source. Honey bees need a continuous water source within half mile of their home hive for a variety of reasons: to mix with food, to keep hive cool, to hydrate themselves. Just like any other creature, they need a continuous source of water. In Missouri, the most popular recommendation is to have a pond. If not, honey bees will go looking for water, usually in the wrong places like a dog water bowl, leaking hose connection or, heaven forbid, a neighbor's nearby swimming pool. But what if you don't have a pond close by, how can you provide honey bees water? I use a variety of bird baths, from new ones I pick up at yard sales to this veritable antique one I have had for several decades and was almost discarded. Actually the old concrete bird bath in this example was sitting in a heap pile because the top had started to break. My handyman had hauled it off because I couldn't seem to get the top repaired and had given up working on it so he assumed I was done with it. I loved the base with the wildlife animals in the design but the top was challenging me and taking up space I needed in the garage. Shortly thereafter, we had rain and I spotted honey bees gathered on the side as soon as the sun was out. Hopeful that I could still have this in my garden, I hauled it back to the garage to repurpose it into what I call a "bee bar." And I put a sign on it that said "do not touch" that was not intended for the bees. Birds like to have a little depth to their bird bath so they can immerse themselves in the water and move their wings. This one had become too shallow for most birds but as I soon discovered was a good depth for giving honey bees water. My repurposed old bird bath from the birds eye view looking down on the concrete frog. When I first started working on this bird bath, the edges were so worn they were literally chipping off in chunks. I had added some ready mix concrete to mend the holes hoping they weren't big enough to fall off. I was wrong. One morning I found the entire original concrete rim on the ground, leaving the repaired concrete providing a more jagged edge. Perfect safe bee landings spots! After painting it a grey color with latex paint, then giving it a second coat, the top of the bird bath looked brand new and ready for business. The fat frog was a gift from a friend and now nicely sits in the flat center of the old repurposed bird bath. Side view of the re-purposed bird bath into a bee bar to give my honeybees a water source. To give my honey bees safe landing spots, I added rocks and sticks so they can safely land and take up the water. Without safe landing spots, I have noticed honey bees will see their reflection in water and land in that spot, usually drowning when their delicate wings become water-logged. When I have fished them out of the water, nearby rocks and the concrete frog provide a nice drying off spot. This re-purposed bird bath has now been in use as a "bee bar" for more than a year and is working quite nicely. In addition to honey bees, I often find other pollinators including butterflies, wasps, ants and the odd bird just stopping by for a drink. On very hot days I have to refill it because it doesn't hold as much water as other bird baths but I like the idea that it's now repurposed instead of taking up space in a landfill. Some of my honeybees taking a drink safely from old sticks in the repurposed bird bath. I don't worry about keeping the water clean, my honey bees seem to prefer older water with a "bouquet" to it. If leaves fall in, I leave them, it gives bees a safe place to hide in the event of a quick thunderstorm. How do you provide your honey bees with water? These are some of the natural events that usually occur in Missouri in January. If you take one of my beginning beekeeping classes, part of your starter kit will include a Missouri Department of Conservation calendar. That's because watching cues in nature is an important part of being a successful beekeeper. Watching nature, also called phenology, is tracking what is happening in nature. There are a number of reasons why people pay attention to nature's calendar. According to the National Phenology Network, everything is connected. "Many birds time their nesting so that eggs hatch when insects are available to feed nestlings. Likewise, insect emergence is often synchronized with leaf out in host plants. For people, earlier flowering means earlier allergies. Farmers and gardeners need to know the schedule of plant and insect development to decide when to apply fertilizers and pesticides and when to plant to avoid frosts. Phenology influences the abundance and distribution of organisms, ecosystem services, food webs, and global cycles of water and carbon. In turn, phenology may be altered by changes in temperature and precipitation. "Changes in phenological events like flowering and animal migration are among the most sensitive biological responses to climate change. Across the world, many spring events are occurring earlier—and fall events are happening later—than they did in the past. However, not all species are changing at the same rate or direction, leading to mismatches. How plants and animals respond can help us predict whether their populations will grow or shrink – making phenology a “leading indicator” of climate change impacts." On a much, much smaller scale, I have watched nature in my one-acre Missouri hillside garden since I moved here in the 1980s. My first entry in my garden diary was a notation about raccoons and wild turkeys. The other early notations marked when wildflowers were blooming, an important fact for tracking bee food sources. Since then, my garden has become a certified wildlife garden and Monarch Way station. My neighbors call it "daffodiland" and I worry when I don't see something in, or on, my flowers. I often wonder about people who say gardens are calm and peaceful, mine seems to be teeming with activity. Missouri Department of Conservation's Natural Event calendar includes wildflowers in bloom. The other handy reference in this calendar is when average frost starts and ends, as well as what trees should be in bloom. Trees are now another important source of pollen for honeybees. Missouri Department of Conservation Natural Events calendar includes daily event listings. The daily listings also making watching nature easier, especially if this is a new practice for you. In addition to when trees and flowers are blooming, the calendar notes other important developments: when June bugs begin appearing, when hummingbirds migrate, when chiggers start biting. It's an excellent resource and customized to our state conditions. Gorgeous photography is another wonderful element of these lovely $10 calendars. 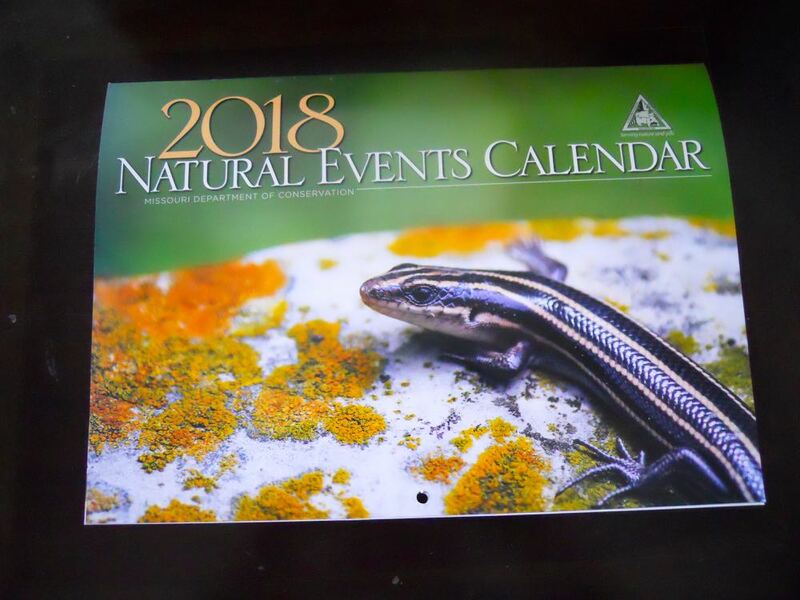 In addition, this $10 calendar has wonderful photos from Missouri Department of Conservation's award-winning photographers. You may have seen some of these photos in Missouri Department of Conservation's free monthly magazine. 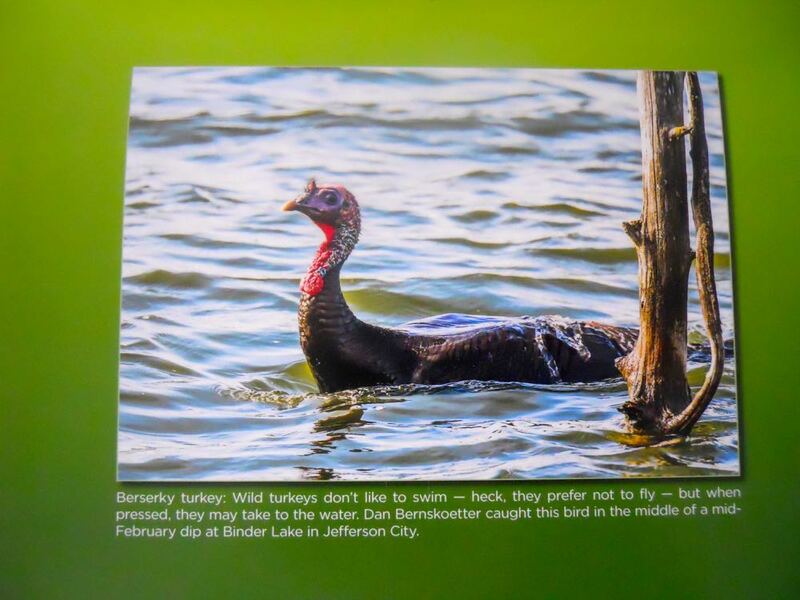 What, a wild turkey swimming?? And, on the backside of the calendar, there is usually an unusual event featured. This picture of a wild turkey swimming immediately caught my eye because I know from watching these lovely wild birds, they don't like to swim. I have my Natural Events Calendar hanging in my kitchen. I use it to add reminders of when I should be doing things in my apiary, and as a reminder to add notations to my regular beekeeping and garden diaries. I'm using a piece of cardboard to give my hives a bit of a winter wind break at the entrance. When I first started beekeeping 8 years ago, it was popular to talk about how to create winter wind breaks around hives. The suggestions included building a wall of straw; making a wooden wall in front of the hives lined up in a row, and a variety of concrete block and brick walls, or combinations of both. One excellent woodworker even talked about adding little awnings over his hives, which prompted me to think to myself, if I only could make half this stuff out of fabric I would be golden! Adding items around hives is also an easy suggestion if one has hives on a flat area. Mine are on the side of a limestone hillside, I'm lucky the hives aren't slipping down the hill let alone trying to keep any semblance of a wall standing. One year I did try the bales of straw in front of my two hives but one of the bales ended up getting knocked down the hill. The most colorful theory was that a bear pushed it over but I would bet a raccoon may have taken an inadvertent slide. Later in the year, I rested my smoker on the top of the bale and almost set it on fire. A local hardware store gave away cut Christmas trees so I used them as hive wind breaks. Another year I recycled Christmas trees in front of hives to give them some wind protection and a little possum family settled in. That option did work better than the straw, at least the baby possums hung on to the trees at one point. I assume that helped to keep the trees from rolling away, as well as the tenacious possums. This year, with temperatures tanking below 0F, I felt out of practice adequately winterizing my hives, especially when the winds were hitting me earlier today and dropping the already cold temperatures even further. As I looked out over my apiary, I decided I was ok with the extra honey super I put on them, giving each colony two honey supers. The black wrap also seemed to be doing it's job, and all lids were nicely sealed over the solid inner covers but I needed to do something to cut the wind hitting the entrance reducers: a cardboard awning of sorts. To make sure the cardboard stays, I cut it long to fit under the black quilted wrap. Selecting a heavy cardboard box, I cut it to the approximate width of my 8-frame hives, tucked a 2-inch border at the bottom and scooted the cardboard under the black insulated wrap I already have around the hive bodies. Would you believe no bees came out to check what I was doing?? Well, would you in this kind of weather? Here I am sneaking the cardboard up under the black wrap to keep it dry from snow and rain. These aren't designed to do much more than ferry the cutting winds from directly hitting the bottom hive entrances where I fit in the smallest opening entrance reducers. The side openings to the cardboard awnings will allow bees to leave if the weather turns warm before I can get out to remove these, and the bungee cords should hold them in place. The plastic wrap will keep the cardboard dry if it rains. Some of my equipment and supplies to get my honeybee hives ready for winter this year. I'm not going to say I waited until the last minute to get this done this year but let's just say the temperatures dipped precipitously the following day. My holdup was getting those emergency sugar cakes dry enough to place on the feeding shims I have at the top of the honeybee hives. I keep the shims on all year to give the bees a second entry and exit to the hive, especially in winter when the front of the hives can get covered in snow. Snow can easily close up the small hive entrance and leave honeybees without a way to get out. The other challenge with getting hives ready for winter is making sure the quilted insulated black hive wrap doesn't cover the entrance, either. After wrapping the hives to help keep the wind out, I check the front to make sure it's still open. I also have a wrestling match of sorts using those red straps. I find them hard to release to elongate them so I also invested in these bungee cords. Did I pick them out because of their color scheme? Well, what do you think?? I bought these bungee cords because of their colors, very bee-inspired. 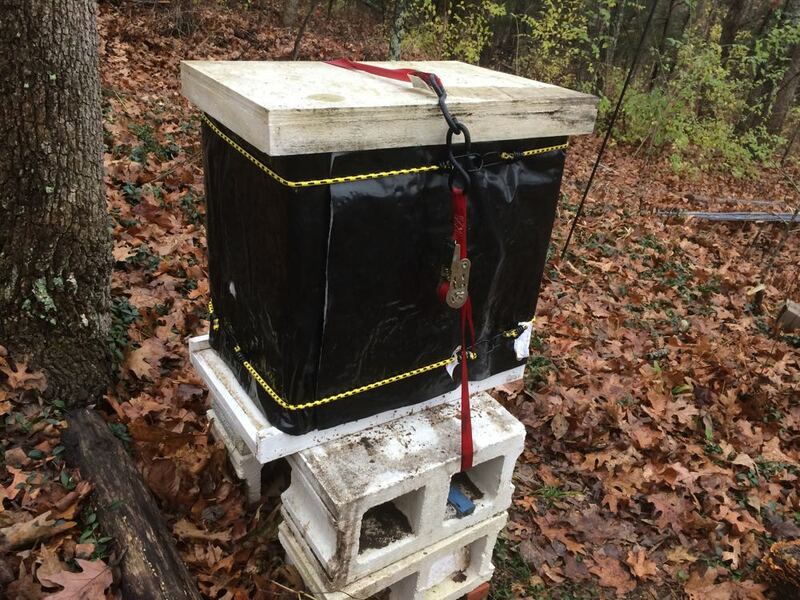 The bungee cords hold the insulated black wrap at the top and bottom of the hives. Then I use the red straps to secure the hives to the concrete blocks I painted white earlier to discourage ants. Another advantage of having concrete blocks is that I can tuck entrance reducers and other equipment into the side cubby holes. This colony is tucked in and ready for winter weather, including emergency food at the top. Before I strap down the hive, I added emergency sugar cakes to the shim at the top. This year, I also left two medium supers full of honey on each colony. Last year, I found the colonies at the top of their honey-full medium at Christmas so I had to add sugar cakes almost two months earlier than I have in the past. Not knowing what the weather was going to be like this fall and winter, I decided to hedge my bets and give them extra honey, which is much better than these emergency sugar cakes I make. Emergency sugar cakes formed in bread pans nicely fit across my honeybee hives. In addition to the emergency sugar cakes, I added a 1x1 inch square of winter pollen patty next to or just under a corner of the sugar cake. Anything larger and I will most likely be feeding small hive beetles instead of honeybees. Some of my honeybees snacking on the sugar cakes at Christmas this year. I don't break the propolis seals on the hives through winter but I can peek under the hood at the top and place my hand inside to find the heat generated by where the cluster is sitting. Once I know where the cluster is located, I can add the sugar cakes over that space so that I know the bees will hit the emergency food as they work their way up through the honey frames. Honeybees don't hibernate, they literally shiver in a cluster while they consume honey to give them energy. And if/when they run out of honey, the sugar cakes come in handy to supplement them. Another view of the honeybees on the emergency sugar cakes at the top of the hives. Once the hive is given the extra sugar cakes, it's time to close it up and hope that all will go well as the colony braves winter. 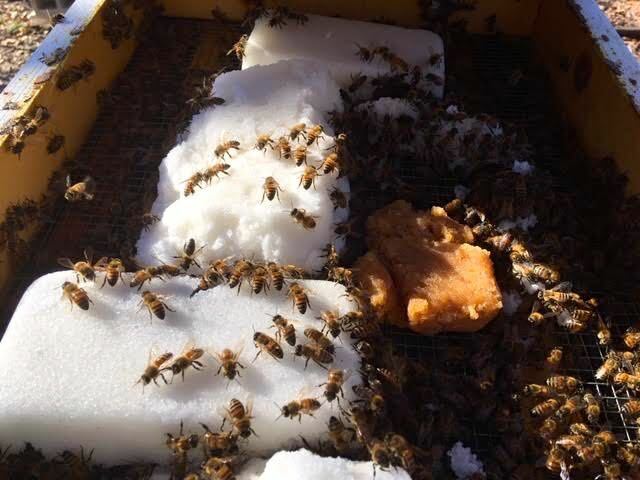 Sugar cakes not only feed but help absorb moisture out of the hive during winter. I had a few peppermint candy canes left over so I added those in the shims. I read somewhere the peppermint is a natural antibacterial so I placed one in each hive wishing the girls a happy Christmas. Last year, snow arrived before I had all of my hives wrapped, I beat the snow this year. Most of these colonies were spring splits with one being a swarm from a known bee tree. The two mother colonies had drone frames removed mid-spring to break the varroa mite cycle and mid-August were tested for the mites. The alcohol wash had less than 2 mites per 100. Water lettuce Pistia stratiotes makes a nice safe landing spot for bees gathering water. Winter is settling into my garden and I am already missing green - anything green. The garden looks very brown as leaves cover most of the ground and I try to keep my bird baths full of water for my bees. The National Weather Service today said we had the driest November on record this year, and December doesn't look very promising in terms of precipitation. One of things I tried earlier this year to keep my bees safely drinking from bird baths was adding water lettuce Pistia stratiotes. These fast-growing, non-native Missouri plants are offered for sale in garden centers for contained ponds. I purchased only 3 to add to a small pond and within weeks the pond was almost covered so I moved some to bird baths. Within days bees were landing in the center of the water lettuce and safely taking drinks so I spread the plants to the rest of the bird baths. Water lettuce off shoots grow fast and can be moved to other bird baths. As long as I kept the bird baths in water, the water lettuce nicely survived and provided a safe landing spot for bees. Surprisingly, the greenery in the bird baths did not prevent birds from taking a drink or even bathing, they just moved in between the water lettuce plants. To make sure the bird baths were safe, I also added a few pieces of gravel and small twigs to the bird baths to give anything small that fell in a safe place to climb back out. The green of the water lettuce made a nice contrast to watch the bees up close. Keep water lettuce out of rivers and other running water areas, it can be invasive. A friend has taken a water lettuce start and is going to try to winter it over. If successful, I will get a start back next spring and then within a few weeks, the bird baths will once again have safe landing spots for bees to stop in and get a drink. This is a jar of small hive beetle lure in my refrigerator for identification training purposes. There were a lot of things I wasn't told when I started beekeeping and for the purposes of this column, I'm going to focus on my refrigerator. There was a time when most of my refrigerator was full of - well, yummy things. Fruit from my neighbor's garden, leftovers from my cooking, and more vegetables than I could possibly eat in a week but I bought because they were pretty. Now that I keep bees, at least two refrigerator shelves have what one of my non-beekeeping friends calls "mystery things." Of course I know what they are but he is more adventurous than I am. Take the time he took a bite out of my homemade protein patty thinking it was homemade fudge. There were scrambled eggs he made one morning sprinkled with bee protein mix. Don't ask, I didn't try it. Then there is a jar of small hive beetle lure that needs to sit in the refrigerator for two weeks to ferment. See how it is sitting next to the pickle jar? In my defense, the jar did originally have a label. However, over time, the label fell off and I, who knew what was in the jar, didn't think it was necessary to replace it. I also made a general public service announcement that the jar sitting on the top rung of the refrigerator was not to be touched or consumed unless one was a very black, and very thirsty, sub-Saharan bug. Come to think about it, I would have bigger problems if I had a small hive beetle big enough to be rummaging through my refrigerator but I digress. Shortly after this small hive beetle lure identification announcement, I was informed that the pickle juice in my refrigerator was turning rancid. Delighted to have another empty jar I could use, I removed the dill pickle jar, composted the dill pickle juice and I frankly can't remember what I did next but I was soon informed again I needed to remove the rancid pickle juice. I pointed out the ring of banana peels floating at the top of the remaining refrigerated jar, see them in the photo? Those are signs that the jar is not full of pickles, or pickle juice, I said, but a very special concoction to, ah, about two inches of fluid was missing...let's just say use in a bee hive. It helps the bees, yes, I said. It tastes terrible, he offered. Well, if you're a black bug it's like a beer, you drink it with your friends. You're now making beer for hive bugs? Very bad black hive bugs, the beer attracts then, then they drown. Now stay out of the lure jar. Directions: Combine all ingredients and allow to ferment for about 2 weeks. Fill center traps with lure. Fill side traps 1/3 full with mineral or vegetable oil. Replace when full of small hive beetles or every few days. With hotter weather, traps should be checked and refreshed more frequently. Clear top of traps of propolis. I do believe that lure jar will now also keep two-legged visitors out my refrigerator. Creamed honey becomes solid, is not sticky and ships easily, a must for my gifts. 1. You will need an area that is not heated to store the seeded honey in jars to set. I have used both an unheated storage area and my garage, both successfully. Ideal temperature is around 50F to 57F. 2. You will need a seed starter. There are several options on the market from a dry powder option to actual creamed honey. I have only used actual creamed honey and started with one I found at a grocery store. Once I had mine, however, I didn't have to buy any more because I used mine as my starter for my next batches. 3. The containers you want to pour the seeded honey in. There is no middle step in this process, no weeks in between when you make the creamed honey and when you bottle it. The raw honey is mixed with the seed, then it is poured into the final containers to set. If you are planning to make this for gifts, then collect the containers you plan to use and have them clean, on hand and ready to be used. I start with a nice smooth creamed honey for starter, such as Sue Bee Spun Honey. A friend has used a start of my creamed honey and made her own, and so forth. The basic ratio is one part creamed honey to 10 parts raw strained honey. Select a wonderful seeded honey to start because the raw strained honey will copy those crystals. Pour the room temperature raw honey in a bowl; add the room temperature seeded honey, then slowly mix it. When I started, I would carefully mix by hand, which is fine for small quantities. This time, I mixed it with a beater on low until light and fluffy, about 3 minutes or so. 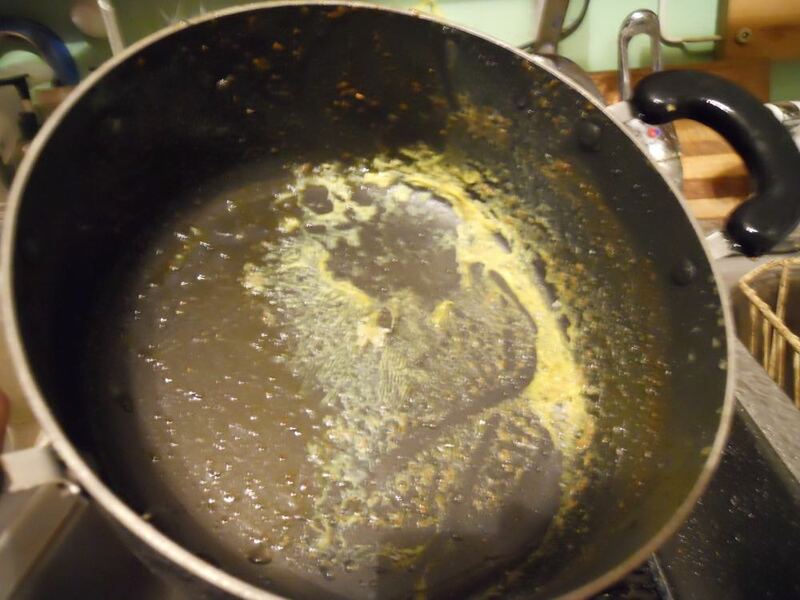 Don't beat on high or you will end up with huge air bubbles in the mixture. Pour into containers. Add lids. I lined a cardboard box with plastic, added the containers, then stored in the cool area to set. Since I used a beater on low to mix the honey and seed, the creamed honey had tiny bubbles. I could have left the mixture in the bowl overnight, scooped the froth with bubbles off, then poured the mixture into the containers but I didn't think about that at the time. Here's how my tiny containers looked with their tiny bubbles. This year's creamed honey mixed on low with a mixer had small bubbles once it was set. The 2 oz. containers set within a day. The larger 6 oz. containers set within a couple of days so I am assuming larger containers will take a little longer to be ready. In general, it should take a week to 10 days for the honey to fully set so I left them for the full time. If you don't like how they turned out, place the mixture in a glass jar in a pan of hot water off the heat source and let it melt back to liquified honey. I have also fed creamed honey back to my bees on a warm winter day to enjoy watching them. Store creamed honey in a cool area, not close to heat such as the stove or in a window. For most people, it doesn't last long so they don't have to worry about storage! 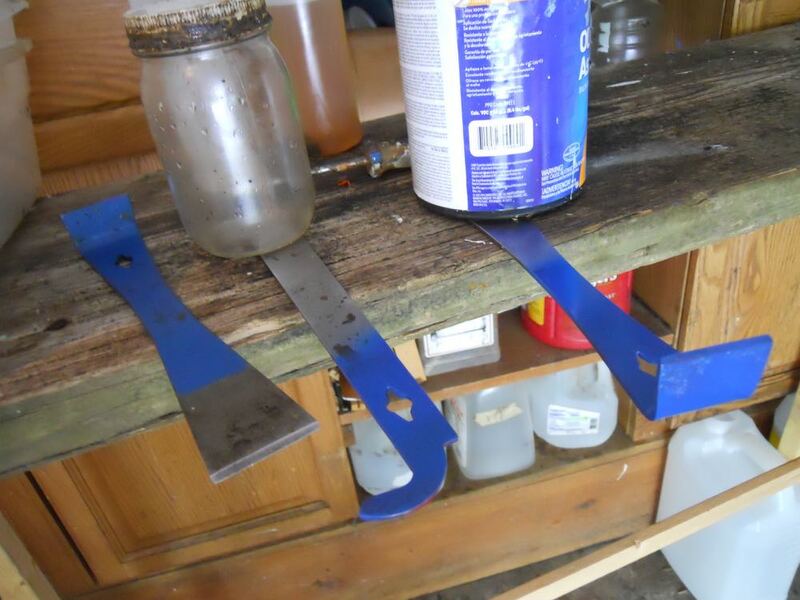 These are some of my hive tools splattered - yes, I used that word deliberately - with blue paint. Maybe this is not the best title for this column, maybe I should call this one of the many things one can do to not lose one's hive tools but it was the latest of many steps I have taken over the years, and the one that seems to have worked the best. So far. 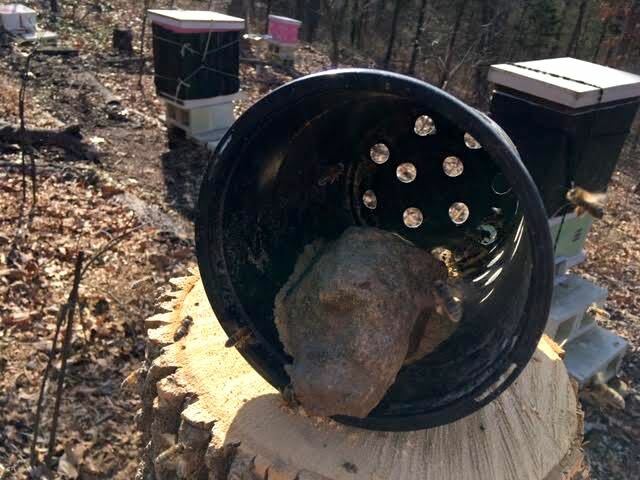 As a beekeeper, one should not only have several hive tools but one should have a way to easily retrieve them, especially out of another beekeeper's tool bucket. Or car. Or bee jacket! Not that my beekeeping buddies would ever deliberately abscond with one of my hive tools but this year it sure seemed like I would get home from a bee yard hive inspection and find myself light of a hive tool, or two. Then the discussion would center around which of the extra hive tools belonged to whom, they all looked alike. A little blue paint and I fixed that discussion, I literally splattered blue latex paint over my hive tools to mark them as mine. It was from an old blue spray bottle leftover from another project so I didn't even go out of my way to buy the paint. My biggest challenge was trying to figure out how to hang them so that both sides could dry. Screw drivers under something heavy make good temporary hangars for drying hive tools. Using another indispensable beekeeping tool, at least in my apiary, screwdrivers, I piled a heavy plastic tote on the screwdrivers and the hive tools could easily hang to dry. Now when they end up in the wrong bucket at the end of a hive inspection, at least everyone knows whose hive tools they have to return! What do you do to mark your hive tools - or do you?